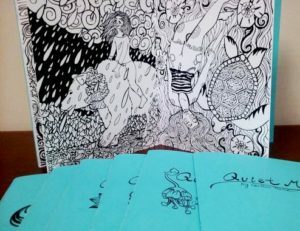 Department of Art | Coloring Book 'Quiet Magic' by FSU Art ’15 BFA Caitlin Hare released! Home » News » Coloring Book 'Quiet Magic' by FSU Art ’15 BFA Caitlin Hare released! Coloring Book 'Quiet Magic' by FSU Art ’15 BFA Caitlin Hare released! The final graduation project of Caitlin M. Hare, ‘Quiet Magic’ is a coloring book explores the relationship between feminine power, mother nature and Floridian wildlife.The book contains 12 full page, digitally printed illustrations on 100+ lb paper, and each book is hand-saddle stitched in a pamphlet binding by the artist. Limited quantity now available for purchase!